Our responsibility to our clients includes informing them about the legal situation they face. We work quickly with clients to understand the problem, spot legal and factual issues, describe the legal process and supply a range of potential case outcomes. We rely on our experience to address client questions and identify the benefits of legal representation. Cases are always unique, and our clients are best served when they have a solid understanding of where they stand in the eyes of the law, what they can expect during legal proceedings and how Shaheen & Gordon, P.A. can be of assistance. In order to begin to provide potential clients with information that may be helpful, our lawyers have identified some frequently asked questions relating the legal services our firm provides. 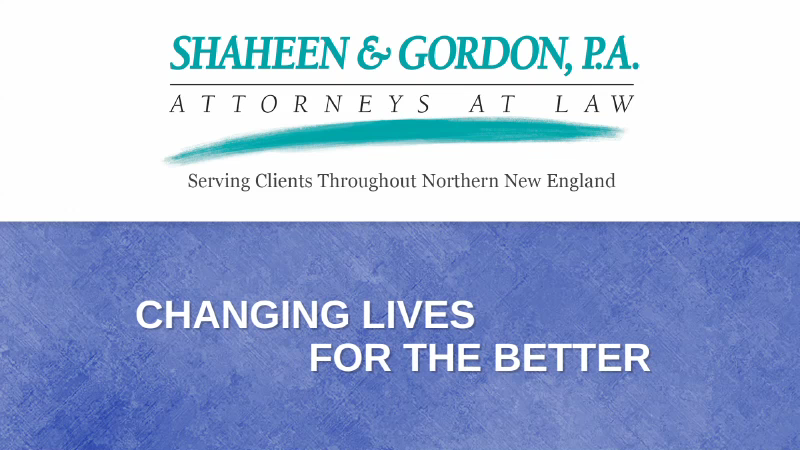 What legal services does Shaheen & Gordon, P.A. provide? Our firm offers legal assistance and representation for more than 15 different areas of law. We represent individual and institutional clients in a range of practice areas including: personal injury and workers compensation, criminal law, DWI defense, divorce and family law, business planning and corporate law, health care, estate planning, real estate, employment, intellectual property and copyright law. Our lawyers come from a range of professional backgrounds, have received top industry honors and have an established track record of success. You can view these legal services on our practice areas page. Legal representation is a constitutional right. Aside from being a fundamental right, attorneys are helpful both by bringing steady representation to difficult matters by navigating increasingly complex legal rules and standards. We have years of experience in New Hampshire's legal and business community. As representatives and advocates, we rely on that experience and our professional relationships to open up lines of communication and put our best foot forward to advance the interests of our clients in a way that they typically can't on their own. Additionally, the law grows, changes and becomes more complex year after year. We keep up-to-date on the latest advances in our practice areas and assist our clients to navigate through procedural issues and legal complexities with the goal of achieving the best available results. If you have a legal issue, your best chances of finding the most favorable solution rest with legal representation. Our attorneys can filter obscure and confusing legal concepts into easily digestible information. They fight to protect our clients, resolve their legal matters and deliver results. This depends on the legal issue involved. All cases are unique, all areas of law different and all clients possess personal needs and goals. Generally, most legal matters can be resolved through settlements, plea bargaining, judgments and verdicts. Some issues are resolved when lengthy procedures are completed and clients obtain the results they envisioned. Other cases may be resolved through alternative dispute resolutions, including arbitration, negotiation and mediation. In order to obtain these resolutions as quickly, favorably and as cost effectively as possible, you need a legal team well-versed in a variety of legal areas and experienced in handling unforeseen, though not fully unexpected, issues. At Shaheen & Gordon, P.A., our attorneys have secured successful case outcomes through every possible means and for a wide variety of unique situations, cases and clients. We are fiercely proud of our trial victories. We find that our ability to resolve cases short of trial relates directly to the trial victories our lawyers have earned for our clients. Year in and year out, our lawyers have delivered important victories in matters large and small to clients after trial. Depending on the case, a trial may take place in front of a judge alone or in front of a judge and a jury. Ahead of trial, attorneys file motions in order to address evidentiary and other legal issues. Witnesses are called at trial in order to supply evidence to either support a claim or defend it. Therefore, effective trial work includes pretrial legal research and motion writing, witness preparation, the examination of expert issues and crisp courtroom presentation. We find that through zealous trial preparation, we are often able to create opportunities to resolve cases favorably. When cooperative resolutions are not possible, our attorneys are not bashful about trying their cases, working with our clients to develop a persuasive courtroom strategy. Deciding when to advise a client to try a case is critical in the process. Risk and reward are inherent in the decision to take a case to trial. The likelihood of success can vary depending on the court where the case is heard and the participants involved. Our lawyers take care to evaluate the strength and weakness of a case so that our clients can make informed decisions regarding taking their cases to trial. If you are interested in how Shaheen & Gordon, P.A. handles trials, you can be confident that our case results stand testament to our abilities to fight in court. Our firm has also earned the largest jury verdict in New Hampshire history - $21.6 million, representing Karen Bartlett in a federal law suit involving a product liability claim against a large pharmaceutical company. We also regularly try criminal cases to verdict, having secured acquittals for clients across the state. Attorney fees will always vary from case to case. We seek to meet the needs of our clients in the most efficient and cost-effective manner possible. We understand that many prospective clients experience hesitancy when choosing legal representation because of financial concerns, and we do our best to openly address the cost of our representation up front so that clients may make informed decisions regarding securing our representation. Our lawyers bring value to our clients in a number of ways, often saving them a great deal of money, time, energy and frustration. Attorneys also significantly reduce the risk of costly legal misadventures, mistakes and errors, all of which can pose grave consequences, depending on the situation. In some cases, our lawyers protect and fight for things that are virtually priceless, such as freedom, family and emotional damages. No matter the case or concern, we set out to openly address the cost of our representation with prospective clients in order to avoid surprises down the road. What states does the firm serve? While our legal offices are primarily located in the state of New Hampshire (Concord, Dover, Manchester, Nashua and Portsmouth), we offer our legal services throughout New Hampshire and northern New England, including the states of Maine, Massachusetts and Vermont. We have attorneys admitted to practice in both state and federal courts. We provide these frequently asked questions only as a starting point for clients interested in legal representation and assistance. All interested clients should understand that legal issues will always vary from case to case and according to the unique circumstances involved. This is why it is wise to receive personalized answers to whatever your questions and concerns may be. If you have more questions or if you would like to speak with a New Hampshire lawyer from our firm, contact Shaheen & Gordon, P.A. today.